Zoe Crecos enters the room. She sees boys everywhere, more than two dozen. She also sees a male coach here, a male coach there. Not one other girl in sight. The setting is a Loyola Academy boys wrestling informational meeting before the start of the 2017-2018 season. Crecos is a freshman—with zero experience in wrestling. “I was kind of scared,” the 5-foot-4 Crecos, a Lake Forest resident and School of St. Mary graduate, recalls more than a year later. Not exactly a suave introduction. “I didn’t mind that question,” Crecos says. The query doesn’t bother the 120-pound Crecos because weight in wrestling is akin to the height of a post player in basketball. 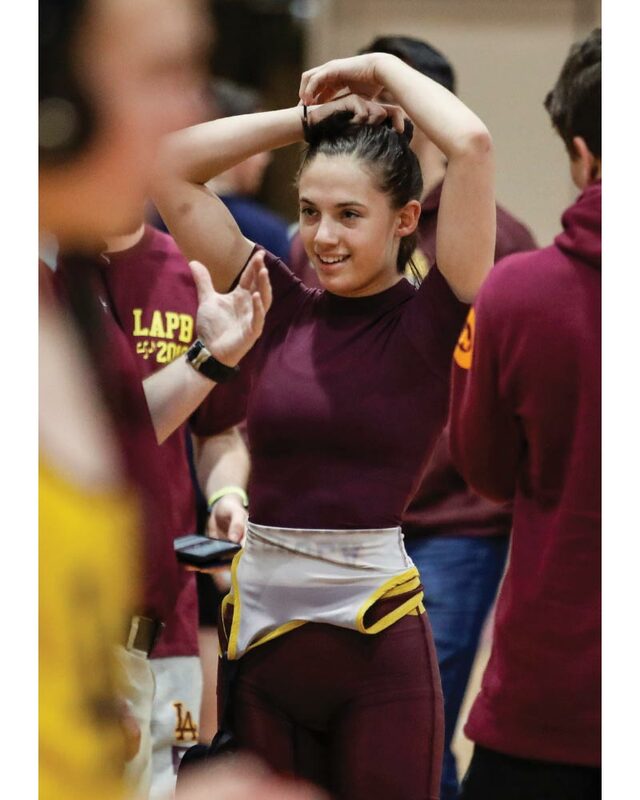 Crecos, who had informed LA’s wrestling coaches of her background in martial arts at the meeting, goes through the tryouts, becomes the first female wrestler in program history, and competes for LA’s junior varsity and freshman teams. She wins a combined 30 bouts—all versus boys—and records 25 pins. Remarkable numbers, particularly for a first-year grappler, who tangles for LA at varsity and JV wrestling meets in her sophomore season this winter. Girls must wrestle boys at the high school level because girls wrestling teams have never vied for Illinois High School Association (IHSA) state championships. That could change. Ramblers varsity wrestling coach Joe Haney thinks schools in Illinois will field girls wrestling teams in three to five years. But this isn’t a story about a girl taking on boys in a contact sport. That is no longer a novelty in wrestling, no longer a curiosity. Zoe Alexa Crecos, 15, is an accomplished wrestler who happens to be a girl. The girl sees potential benefits via the sport, none much bigger than receiving a college scholarship. That made sense. Barr, after all, had watched her daughter claim a gold medal in jiu-jitsu—more of a combat sport than wrestling. Crecos, representing the Chicago-based, legendary Carlson Gracie Team, topped the Teen 3 (females aged 14-15) Orange/Light division at the Pan American Games in California last February. With the achievement, Crecos also emerged as an International Brazilian Jiu-Jitsu Federation (IBJJF) champion. “Zoe is not a traditional wrestler by any stretch,” Haney says. “She is a thrower more than anything else, a skill and a strength she developed through her martial arts background. She is always dangerous whenever she is on her feet. You see her good balance when she’s on her feet, her readiness to attack, to gain an advantage. She earned the spot in our program. Crecos was 8 when she opted to give boxing a try at a warehouse gym in Highland Park. For nearly a year she trained there, participating in punching and agility drills and eventually sparring against 17- and 18-year-old males. She then got involved in the martial art and combat sport Sambo before immersing herself in judo and jiu-jitsu. She learned techniques and battled frequently at the Cohen Brothers Judo and Wrestling club in Vernon Hills and at Carlson Gracie Headquarters in Logan Square. Crecos began strength training at the age of 11 and continues to lift weights regularly. She pinned a Brother Rice High School boy near the end of the first period at a home meet on December 11. Crecos then extended her right hand to her fallen foe, who grabbed it as he returned to his feet. Moments later the referee gripped Crecos’ left wrist and raised it. The victor displayed a quick smile before jogging off the mat to receive congratulations and handshakes and high fives from her teammates and coaches. “At first it felt weird having only boys for teammates,” admits Crecos, who sometimes faces 145-pound teammates in matches at practice. “But everybody was welcoming, supportive. Following her freshman wrestling season, Crecos wrestled in a pair of girls wrestling state meets on the same weekend, taking runner-up honors at the Illinois Girls’ Folkstyle Tournament in Aurora and finishing in fourth place at the Illinois Wrestling Coaches and Officials Association (IWCOA) Tournament in Springfield. Most of the qualifiers at each tourney had had four or five years of experience in the sport compared to Crecos’ grand total of … three months. Crecos wrestles at either 117 or 122 pounds versus girls. Ramblers 182-pound wrestler John Michael Kelly, now a senior at Loyola Academy, served as coach/supporter for Crecos at the event in Springfield last year. His car trip to the state capital started at 4:30 a.m.
“Tenacious,” Kelly says of one of Crecos’ salient athletic traits. “When she’s out there she’s not timid at all, not shy. Willing to give it her all each time, while showing good sportsmanship in every match. Zoe has speed, good techniques, and she knows how to get in the right position to execute moves—quick moves. And a busy musician. Crecos plays the piano, violin, and tuba. 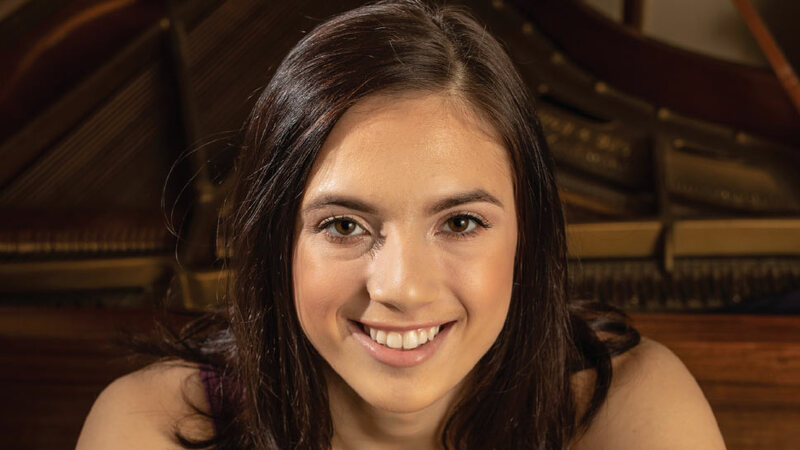 She is a member of Loyola Academy’s marching, pep, and concert bands. Crecos could have grumbled to Haney about the day she was having at a wrestling invitational at Vernon Hills High School in November. She opted to soldier on instead. “I asked her, ‘You OK?’” Haney recalls. “It was getting rough there at the end, and I didn’t want her to get discouraged. But she told me, ‘I want to continue; I’m ready to go.’ Zoe is very businesslike, works on things, does the job. She learns from her mistakes.